(SOS) - When Halimo and her family arrived at Hargeisa, Somaliland's capital, she sold their last goat for $10. The rest of the family goats, sheep and camels died in the drought that, for the fourth year, is ravaging the region. Like hundreds of other internally displaced families in Somaliland, the family has been helped through of the emergency relief they receive from SOS Children's Villages. "When our livestock died because of the drought, we decided to travel to the city to find work," says Halimo Dahir. 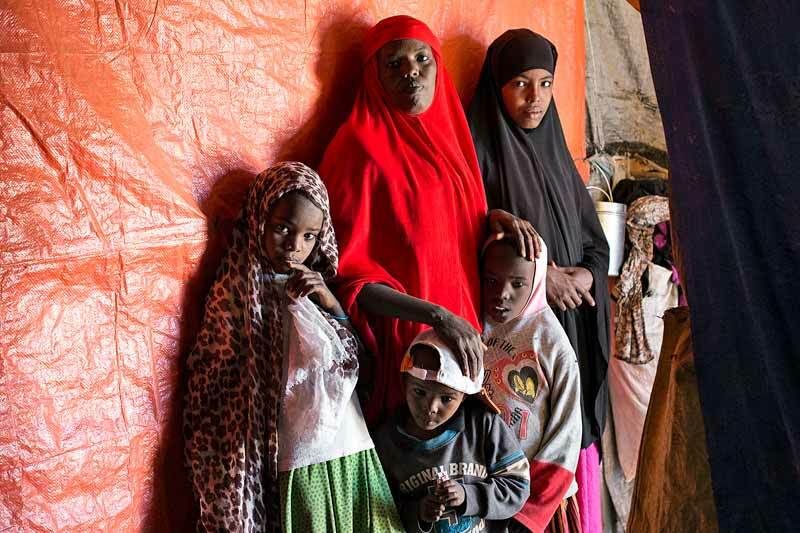 Halimo, her husband and their six children – who range in age from two to 14 - now live in a small shelter in a displacement camp two hours away outside the city. The door of the little home is a curtain made of old relief bags that have previously been used to store sugar and rice. The home is just big enough for the family's only piece of furniture, a mattress where they all sleep. The air is full of sand and dust. Halimo's two-year-old daughter Aisha coughs constantly. "I miss our old home,” Halimo says. “It was beautiful. We had built it ourselves and we owned it. The house we live in now is one we borrow from another family and I'm afraid we'll be thrown out at some point." "We travelled to Hargeisa to find work. My husband now earns $50 a month, but it's far from enough for us to buy food for the whole family," adds Halimo. The family once owned livestock and lived close to the Ethiopian border, where their home was a traditional Somali cottage made of braided grass and large pieces of colourful fabric. They would move about so their camels, goats and sheep could graze. Then came drought. The animals gradually died and there was no milk and meat for the family to eat or trade. SOS Children’s Villages has provided support through an emergency relief program so the family can purchase food. "Before we received help from the SOS Children's Villages emergency program, we did not eat every day and we never had more than one meal a day," says Halimo. Authorities in the Somaliland region estimate that one million people, in a territory of more than 3.5 million, are affected by the drought. Some 59% of the inhabitants in the worst-affected areas have lost all domestic animals and have had to leave their homes in search of work in urban areas. Large stocks of livestock have died, while others have been sold in a hurry to get money for food and water, which have become increasingly expensive because of the drought conditions. Many people rely solely on the community and international relief. Halimo and her family have lived in their temporary shelter for just over a year. Halimo spends her days taking care of her children and cooking. The days are so similar that they melt together. On Friday, the family goes to mosque. Halimo prays for a better life. SOS Children's Villages is responding to disasters and humanitarian emergencies across the globe. Please help us continue to care for children and families who are in the direst of need. Donate now to the SOS MAYDAY Emergency Relief Fund. In a region with an estimated 3.5 million people, 91 out of every 1,000 children die before they reach five years of age, compared to the overall Africa rate of 76.5 per 1000 live births. 75% of all young people are unemployed. 11% of children in Somaliland have lost one or both parents, and in the capital Hargeisa, with around one million people, there are an estimated 3,000 children living on the street. Although Somaliland operates as a self-governing entity, it is not internationally recognised as an independent state. SOS Children’s Villages began working in Somaliland in the 1990s, and today works to strengthen families, care for children, and provide educational support. Our emergency response programme began in mid-2017 with an immediate goal of providing food vouchers to families in Somaliland facing severe nutritional needs because of a prolonged drought. Nearly 900 households in the Hargeisa, Gabilay, Sheikh and Berbera districts have received food vouchers. The vouchers can be used only to buy food. The voucher system is preferred over distribution because it better addresses daily nutritional needs of vulnerable families while also supporting local growers and markets. SOS Children’s Villages also provided nutritional screening for more than 270 children under the age of five and for 70 pregnant women or breastfeeding mothers, launched a nutrition education campaign, and provided training to 160 caregivers in how to improve hygiene during the food preparation process.